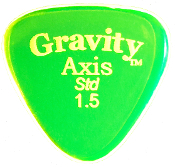 Another pick with the tri-tip design, the Axis is shaped with very rounded tips, making it a favorite for strumming styles and mandolin players. The wide body gives your fingers additional gripping surface, ensuring the pick stays in your hands even during aggressive play. Also, the identical tips frees you from worrying about the pick turning in your hands since there’s another tip waiting to take over right around the corner. These features makes the Axis a dependable pick for the soft strummer or "banger's" alike.